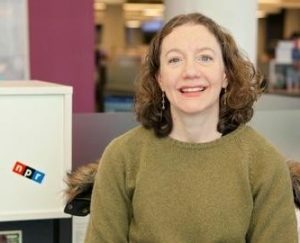 Correspondent Carrie Johnson came to NPR in 2010, after a long career in print. She tackled the challenge of transitioning to radio, in part, by developing an unusual approach to writing out her tracks (the reporter’s narration). If you’d like to hear the story she’s annotating, it’s at the bottom of this post. Full transcript is here. When I started at NPR, I already had been interviewed on the radio and on television a bunch of times. But the experience of narrating a story into a microphone from text I had written really perplexed me. How to read lines from a page in front of me without SOUNDING like I’m reading? It’s much more difficult than it appears. I’m still getting the hang of it. But I was lucky then and am lucky now to rely on advice I got from radio veterans, including longtime newscaster Paul Brown, former NPR trainer Jonathan Kern and the late, great David Candow. I try to keep every line self-contained – and one line. I leave a full line of space in between to make the script easier to read. Comey says HE remembers that past by keeping a wiretap application on his desk at the F-B-I. That document is what his predecessor used to surveil and harass Martin Luther King Junior. Even more insidious, Comey said, is unconscious racial bias. When I use a clause, I try to think of it as its own phrase, and breathe around it. James Comey said law enforcement needs to account for a troubling inheritance. I capitalize some words I want to emphasize in the voicing – as the word HE and THESE below. To punctuate the point, he recited THESE lyrics from the Broadway musical Avenue Q.
I also use a lot of ellipses to remind myself to stop and breathe. The FBI director concluded with a plea for police to acknowledge their shortcomings. To think about the black man walking home from the library … before they approach him. Comey also said it’s easier to point the finger at law enforcement…when something deeper is at work. Sometimes I try to punch up the script by adding a separate phrase at the end. And he said most police get into the job to help people. And they do. And when I write a series of ideas, I break up the lines in the script. and economic disadvantage in many poor neighborhoods. Want to hear Carrie’s story?